Jennifer Abbott is a documentary maker, media artist & AVID editor. A Cow at My Table is her first feature documentary. Her past work includes the experimental short Skinned which toured North America & Europe including New York's Museum of Modern Art. She is the editor of the book Making Video 'In': The Contested Ground of Alternative Video on the West Coast. She also teaches at Emily Carr Institute of Art & Design in Vancouver. 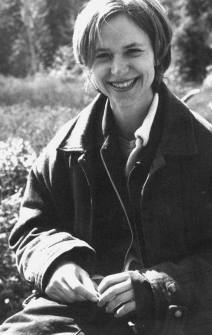 Carol J. Adams, Ph.D. – Texas – Author of The Sexual Politics of Meat: A Feminist Vegetarian Critical Theory (10th anniversary edition soon to be released) as well as many related publications. Jeannette Armstrong – Okanagan, British Columbia – Writer, artist, teacher and Aboriginal rights activist; Author How Food Was Given and many other works of fiction. Gene Bauston – Upper State New York & California – Began rescuing farm animals over 10 years ago with partner Lorri Bauston - earning money to pay for their care by selling veggie dogs at Grateful Dead concerts. They now have two sanctuaries for over 400 farm animals, Farm Sanctuary East in upper state New York and Farm Sanctuary West in California. Karen Davis, Ph.D. – Machipongo, Virginia – Founder and Director of United Poultry Concerns: Author Prisoned Chickens, Poisoned Eggs: An Insiders Look at the Modern Poultry Industry. Ian Duncan, Ph.D. – Guelph, Ontario – Head of the Animal Welfare Department at the University of Guelph and a leading Canadian ethologist. Howard Lyman – Montana & DC – 4th generation cattle rancher, feedlot operator & farmer turned vegetarian advocate; Director of the Eating with Conscience Campaign of the Humane Society of the U.S.; Thrown into the spotlight after appearing on the Oprah Winfrey Show and being sued, along with Winfrey, by the Texas beef industry; Author Mad Cowboy. Susan Kitchen – Calgary, Alberta – Livestock industry advocate; Manager of Alberta’s Foundation for Animal Care, an organization which promotes the image and interests of livestock industries. Jim Mason, LL.B. – Mt. Vernon, MO – Co-author of Animal Factories (1980), one of the first books to investigate modern livestock practices as well as many related publications; Activist, attorney & journalist. Tom Regan, Ph.D. – North Carolina – Considered to be one of the fathers of the modern animal rights movement; Author of the definitive work on animal rights theory, The Case for Animal Rights (1983), as well as many related books; Activist; Professor of Philosophy in North Carolina. Joy Ripley – Calgary, Alberta – Current President of the Canadian Federation of Humane Societies; Past-President of the Alberta SPCA and member of various government task forces on animal-based agriculture. Susan Schafers – Stoney Plain, Alberta – Owner of Holborn Poultry Farms, an Alberta-based agribusiness. Peter Singer, Ph.D. – Australia – Considered to have started the modern animal liberation movement with the publication of Animal Liberation in 1975; author of many related works; Professor of Philosophy & Bioethics in Australia. Vandana Shiva, Ph.D. – New Delhi, India – Physicist & world renowned activist; Author of Biopiracy: The Plunder of Nature and Knowledge & Chenmmeenketto: Towards Sustainable Agriculture as well as many related publications. Anonymous Trucker – A trucker willing to speak about his experiences shipping animals. Because he is critical of routine transportation practices, he feared losing his job and even physical harm, so he chose to remain anonymous (Full transcript of interview available through Canadians for Ethical Treatment of Food Animals 604.261.3801 – www.care@cetfa.com).